On behalf of the Board of Directors of the AFP Central Ontario Chapter, welcome to our new Chapter Website and information resource. 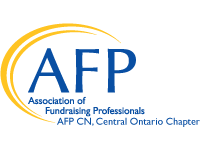 AFP Central Ontario has been an active Chapter for 3 years with 40 plus active members, representing charities of all sizes and services through the County of Simcoe, Districts of Parry Sound and Muskoka, Greater Sudbury and beyond. Our goal is to provide education, information and networking to the fundraisers in our communities. We believe that as fundraisers we all have the ability to change our communities for the better through the work we do. We don’t raise dollars; we provide the opportunity to have a positive impact, through our work to shape the lives of the people, families, children we serve. AFP believes that to grow our communities, we need in invest in our fundraisers, to grow their skills and confidence to have this positive impact. AFP is about you! We host quarterly lunch and learn education sessions, a celebration of National Philanthropy Day, networking sessions, and in partnership with the Planned Giving Council, the annual Symposium focusing on how our sector and donors are changing lives. If you are interested in learning more about how AFP can support your growth, please join us at one of our sessions, or feel free to contact me directly. The AFP Central Ontario Chapter celebrated the presentation of its first National Philanthropy Day Youth in Philanthropy Award on November 15, gathering together volunteers, fundraisers and philanthropists to mark the occasion. Congratulations to our inaugural honoree, Zach Hofer, whose remarkable "Zach Makes Tracks" brought awareness and much needed financial support to the issue of child and youth mental health in this region.